Miniature F-15 stick grip as paper weight [DSK-341N] - $49.95 : Metalcraft by Blair - military gifts and memoribilia. Measures only 3 inches high.. These miniature stick grips will also be coming out very soon as letter openers. This item can be mounted in numerous style presentations -this is a sit down flat presentation. 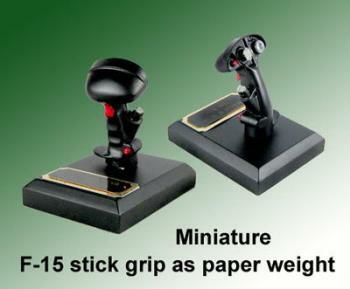 This is our very 1st miniature stick grip presentation-- we will be offering a complete series of aircraft stick grips in miniature in the coming months.. start your collection now and dont miss any. This is a super presentation ---you will not find it any where else other than at Metalcraft by Blair as we make it. What an eye catcher to have sitting on a desk.. If looking for a TOP GUN Award then this is it. or for any other type of award presentation-- or how about just to say congratulations for a job well done. If you fly an airplane this is one item you will keep forever. WE make this presentation useing a replica of the original -- also add the badges and rank of your choice-- it comes with an engraved name plate -- Also please note that we have a good selection of other like items to choose from.